Goodreads Summary: Red-hot author Miranda Kenneally hits one out of the park in this return to Catching Jordan's Hundred Oaks High. I loved Miranda Kenneally's first book, Catching Jordan, so I was very excited to read Stealing Parker. The book turned out to be different than I expected, but it still had so many of the characteristics that I loved from Catching Jordan. Only Miranda Kenneally could turn a book about sports into a wonderful romance story that even someone who is anti-sports would want to read. Once again, the playing field is just a backdrop for the story, and so much of the action happens outside of that setting. Stealing Parker explores the difference between love and lust, hookups and relationships. Even though Parker's flirtation-and-maybe-more with Brian should theoretically be doomed from the start, it's impossible to not root for them. After all, he's just the guy Parker needs...at least in the beginning. But Parker has other things going on in her life at home and even at school. I loved that nobody in this book was one-dimensional; they all had their own stories. Because they were all so dynamic, I felt like a student at Hundred Oaks High along with them. And for fans of Catching Jordan, we do see Jordan and Henry again. I have to say that religion plays an important part in this book. Parker was raised in church, and she has a habit of writing down her prayers and burning them. I liked reading her prayers, as they gave more insight into her thoughts. However, I couldn't help but be bothered by the conservative nature of the church she attended. It was necessary for the tension, and it makes the small-town setting come to life, and yet I still wished it could have been different. 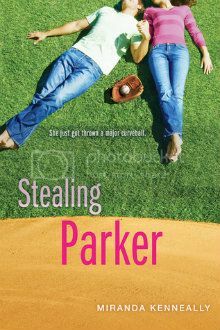 Stealing Parker is a great coming-of-age story about a girl choosing who she wants to be and what will rule her. With romance, great friendships, and more, this is a book you will want to add to fall reading lists. I can't wait to read the next book by Miranda Kenneally!